These are three more releases in EMI's seemingly endless (but luckily so!) "Great Recordings of the Century Series." All three are at mid-price, and contain performances that are as relevant today as they were at the time of their first issue. 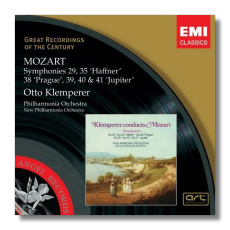 It is good to see Klemperer's Mozart symphonies reissued, although one wonders why EMI didn't include more of them – for example, the 1956 recording of the Symphony #25, or the 1963 recording of the "Paris" Symphony. (Both are with the Philharmonia Orchestra.) Klemperer's Mozart will sound heavy to many of today's listeners, who have become used to smaller ensembles playing "original instruments," and faster, "historically informed" tempos. It's all relative, though. The sound that Klemperer draws out of his orchestras might be bigger, and his interpretations might be more self-consciously imposing (Beethoven-like, one might say), but their proportions are perfectly judged. In other words, they are filling not fattening, and graceful but not delicate, so I don't think it's entirely accurate to think of them as "heavy." They allow Mozart a splendor and a bigness which I think many conductors unfortunately are reluctant to give him today. The Amadeus Mozart – the man with the silly laugh – is far removed from these serious but never dull readings. Who conducts Mozart like this today? The significance of this reissue is self-evident. These recordings were made between July 1956 (Symphonies #39 and 40) and 1965 (Symphony #29). Although the characteristics of the engineering change, Klemperer's approach does not. (The 1965 recording has a lot more "air" around the music than the other recordings.) These are digital remasterings from 2000, with the exception of the Symphony #39, which is newly remastered, and presented, for the first time, in stereo. 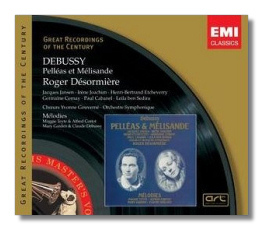 The famous Désormière recording of Pelléas (1941) has been reissued several times, even on labels other than EMI. At least one version I know of squeezes the opera onto two CDs, but it does so at the expense of continuity, by introducing a break between the second and third scenes of Act Three. It is much better as presented here, even if another disc is required. EMI makes it worthwhile by including, as a sort of bonus (but what a bonus! ), a generous selection of mélodies sung by Maggie Teyte with accompaniments by Alfred Cortot (1936), and Mary Garden singing the opera's Tower Scene, plus three of the Ariettes oubliées, with the composer himself at the piano (1904). The historical value of the Garden/Debussy items is obvious – she created the role of Mélisande, after all. Having said that, Pelléas is virtually impossible to excerpt anything from, and the quality of the recording is primitive, although I'm sure EMI did what it could to make it presentable. The Teyte/Cortot items require fewer excuses. Both Garden and Teyte prove that one doesn't have to be French to sing Debussy's vocal music idiomatically. You couldn't get more French than the Désormière recording. It was made in Paris during the darkest days of World War Two under what must have been very trying conditions. Recording materials (e.g., wax for the master discs) were in very short supply. It was a long process. The first session was on April 24, and the last on November 17; 20 sessions in all were required. Even so, the opera's emotional continuity is maintained, almost as if the performers had gone straight through the opera in front of the microphones. Amazing. Joachim's voice, with its characteristic rapid vibrato, will not be to everyone's taste, but she knew the role inside out, and she projects Mélisande's vulnerability with strong musical values. Jansen's Pelléas has never been surpassed, not just because he is such a fine vocal actor, but because his voice is so perfectly placed: a true "baryton-martin" (high baritone) comfortable with this role is very rare indeed. Etcheverry's Golaud is human and believable: not a monster, but a man driven to the breaking point by something on which he cannot put a finger. The other roles are strongly cast too, and the singers get to the heart of their characters. Désormière's expansive conducting makes you forget that the 78-rpm medium necessitated changing records every four minutes or so. Even through the dated sound one can appreciate his attention to every detail. This is a new digital remastering. One can hear surface noise here and there, but it is unimportant compared to the performance and the music itself. Thoughtfully, EMI has included the French texts and translations, not just for the opera, but also for the mélodies. When one takes all these things into consideration, this new reissue really isn't any more expensive than those that preceded it, even on budget labels. Victoria de los Angeles was another superb Mélisande, and it is unfortunate that her EMI recording of the complete role (with Jansen repeating his Pelléas!) now is available only within an expensive set on the Testament label. Despite her Spanish origins, she was very comfortable with the French repertoire. She sang it with great style and intelligence, although one could argue that her voice was a little too full and rich to be ideal for it. It would be hard to find a Shéhérazade more lovely than hers, but something of the music's danger and tension is missing, and this is partly due to the voice itself, which is more of warm bath than a shivery spray of cool water. I think the balance of the CD finds her in more congenial territory. Something about these mélodies, even those accompanied by orchestra, brought out a more specific response from her. Indeed, Debussy's song about the wartime orphans whose home has been taken away from them is performed with a remarkable mixture of innocence, pathos, and anger. 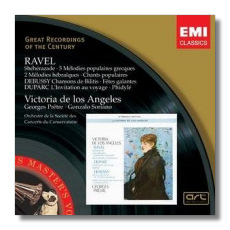 The fourth of Ravel's Chants populaires ("Chant hébraïque") is another wonder; the effect De Los Angeles creates here is quite hypnotic. Appropriately, Duparc's L'Invitation au voyage is the very soul of "luxe, calme, et volupté." One can't help sighing with pleasure. These recordings were made in 1962 (the selections with orchestra) and in 1966 (those with piano). The recording quality makes some of the soprano's high notes sound a little "peaky" in the later selections, but this is not too bad. Again, these are new digital remasterings, and texts and translations have been included.